Acknowledged author Rowland Miller wrote Intimate Relationships comprising 592 pages back in 2017. Textbook and etextbook are published under ISBN 1259870510 and 9781259870514. 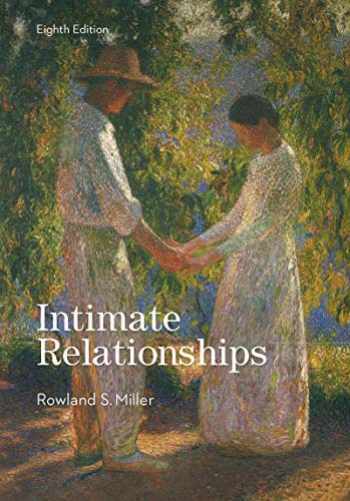 Since then Intimate Relationships textbook received total rating of 3.5 stars and was available to sell back to BooksRun online for the top buyback price of $68.61 or rent at the marketplace. Drawing on psychology, family studies, sociology, communication studies, and neuroscience, Intimate Relationships is a comprehensive and current overview of relationship science, written in an engaging and accessible style. Supported by SmartBook™, McGraw-Hill’s adaptive and personalized reading experience, the eighth edition of this best-selling text includes hundreds of new discoveries and findings from the last three years, as well as over 600 new references.